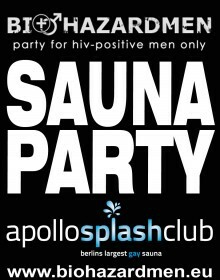 On November 25th, 2016 our second BiohazardMen SAUNA Party EXCLUSIVE for HIV-positive men ! But that's not all: Many of the cabins are also open to all for free use !!!! Of course you can also rent a private cabin, we changed our online ticket system, so you can book already your favorite fixed cabin in advance. If cabins still should be free, you can then also directly book them in the evening at the entrance of the party. For all fetish lovers: it is not necessary to be completely naked, it's also possible to come in your favorite fetish outfit. However, due to hygiene reasons please NO STREET SHOES! We also have the FAQ (Frequently Asked Questions) on our website and also several questions about the Sauna party's, just take a look over.